Schooling as we know it must change if we are to remain relevant to our students. As each day passes, students are becoming increasingly empowered independent learners, taking control of what and when they are learning, and in many cases leaving us teachers and parents behind. Nonetheless, schools can and should continue to play an essential role in the life of its students, inventing new structures to facilitate the learning of essential 21st Century skills. Students need our expertise and support to help them understand and navigate the power of global networking, learning and communication. Much has been said and written over the past few years about the new understandings of how the brain learns, the impact of technology on education and the challenge schools face in remaining relevant. While most educators are thinking deeply about these issues, few can put a finger on a concrete vision for a new 21st Century model of school. We seem to be chipping around the edges with “reforms” that don’t really address the limitations of current practice in most schools, such as students moving from one isolated subject to the next or students being lectured at and required to produce for grades. 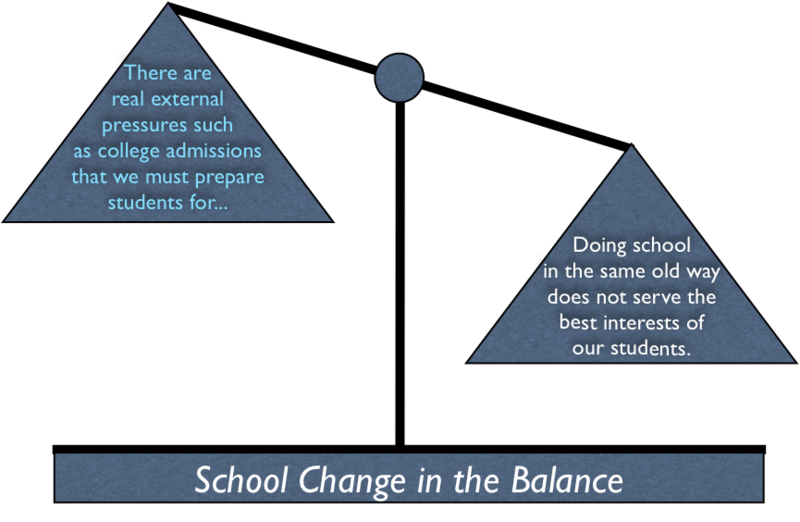 With a desire to affect meaningful change in our schools, we wonder, why is school change so hard? and How do we truly innovate and progress? We’ve always done it this way and while it’s imperfect, it gets kids into university. Various systems outside of our control, such as college admissions, and external exams (i.e. SATs, IB and AP exams) force us to maintain an old model of schooling. There is no proven viable alternative to the current structure. While the above reflects real issues for educators, it doesn’t excuse inaction. The fact remains that the world is rapidly changing and that schools in the long run must also change in order to continue to impart the values and skills students will need as they enter the real world. I do not want to underestimate the challenges educators face in implementing meaningful change. However the way forward is to accept the dual realities of our times. Yes, there are real circumstances such as college admissions requirements or external exams that we must effectively prepare students for, but the world of work is not looking for test takers, but for problem solvers who can function creatively and collaboratively. Yes, there is a comfort in schooling that is similar to what we remember when we were students, but an outmoded model of schooling does not serve the best interests of today’s student. So there is a delicate balancing act that has to take place in order to effect meaningful change. Most importantly, we must include all school constituents (teachers, students, parents) in the process and tap into their collective wisdom to reach a vision of the future. It is the responsibility of educational leaders to structure an inclusive process within our communities, where disparate voices can be heard. In today’s globally connected world, educators, students and parents are faced with unprecedented opportunities and fast-paced challenges. While we cannot shirk from our responsibility to ensure that our schools remain relevant to learners, we must also accept that the change process is not linear and can take many twists and turns. Nonetheless it is an exciting challenge and a noble cause to pursue. In Disrupting Class, How Disruptive Innovation Will Change the Way the World Learns(2008), Clayton Christensen, Professor of Business Administration at the Harvard Business School, makes a compelling case for how schooling as we know it, will become obsolete or taken over by new educational innovations such as online learning in the very near future. Christensen discusses how to use the disruption new technology causes, to foster school transformation. In Personal Learning Networks, Using the Power of Connections to Transform Education, Will Richardson and Ron Mancabelli discuss ways to harness the power of global networking. in this book they make a persuasive case for why educators should ensure that all learners (including teachers) are networked through a variety of electronic resources, not only to access information but to contribute to the global network as well. After all, most of us (and certainly our students) are already connected through various social media. It behooves schools to teach our students how to effectively and responsibly use this powerful tool to further their learning. Very nice. I agree that as educators, we struggle with balancing the qualitative with the quantitative on a daily basis. “Is it testable?” is a question that often drives our decision-making, when really we should be focusing on things that are entirely un-testable. Can only agree with your comment. We need to move beyond the test driven learning approach.